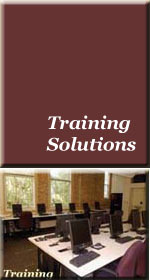 At Advisal we are committed to excellence in the quality and content of our IT training solutions. We know that your project success requires your team to deploy technology tools and project management effectiveness timely and smartly. To meet these needs, Advisal offers a comprehensive range of training services designed to maximize the value of your investment. We offer flexible learning environment and in-demand courses, individually customized to fit the busy schedule of each trainee. Course customization - We will create all course material, presentations and teaching approach that fit your needs. Our custom courses combine your data and business issues with our methodology to provide company specific content and workshops. Multiple Delivery methods - In addition to customizing course content, we can customize deliverables. Our standard courses are instructor-led with course manuals. We can also provide computer based training and web-based multimedia training solution (e-learning) for your convenience. Onsite training - Advisal trainers will come to your site to train users on requested programs, either standardized or customized. We provide skilled instructors, training data and class materials. Forging ‘win-win' relationship with our Technology partners to keep trainees abreast of latest technologies. Learn to build attractive web pages for your project or organization faster, smarter with Adobe Photoshop, Macromedia Dreamweaver, and Flash. Learn to master the art of enterprise data modeling with better tools from Business Objects and Computer Associates. Learn to quickly create custom reports from various data bases with popular tools like Crystal Reports, Brio, and Discoverer. Successful businesses and organizations create projects that produce desired results in established timeframes with assigned resources. As a result, businesses are increasingly driven to find individuals who can excel in this project-oriented environment. Learn the skills and the processes to become an effective Project/Program Manager. As we expand our capabilities and reach out to explore new markets, our fundamental focus remains unchanged: always deliver better, cheaper, faster, and smarter results to keep our customers happy and stay competitive. For more information, please contact Advisal Training team at info@Advisal.com.